Can you believe it's the beginning of March already. Where did the first 2 months of this year go? In only a couple more weeks, we will be celebrating St. Patricks day and drinking green beer. Well some of us that is. For me, I'm on the lookout for a nice bottle of green wine! For now, I'm enjoying the process of actually keep up with a QAL. This one is just 2 blocks a month, thru mid August. 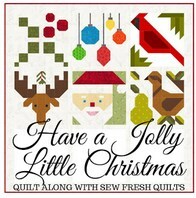 Allowing plenty of time, to get your quilt done for the holidays. Even better than that, I'm loving these fast and easy blocks. I can hardly wait until July 29, when the moose block is released! Wonder if Lorna knew it was my birthday, and that would be the best present ever?????? 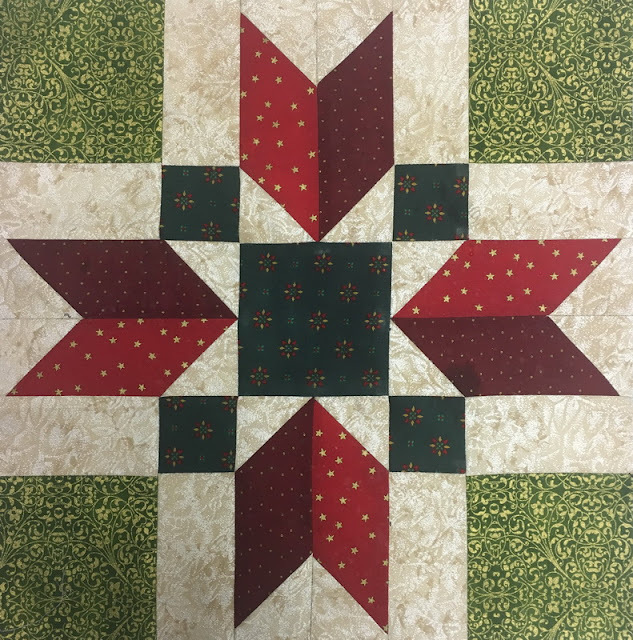 "Poinsettia" block is the latest release. What a fun block. I keep looking at it and seeing the potential for some great dimension when using different fabrics. Looks like I am going to have to do a little playing with this block soon. Here's what I've done, so far. A big thanks to Lorna at "Sew Fresh Quilts"
I am very impressed with all your blocks. I am sure it was planned for that block to be out just for you on your special day!! No, I can't believe it is March already either. Love those blocks so far!